For the first time in years, the Razer Blade Pro feels like it deserves the name. Despite its premium price, the Blade Pro has arguably been Razer’s weakest laptop ever since 2014. That’s the year the 14-inch Blade (no surname) received a massive performance upgrade, bumping up to an Nvidia GTX 870M graphics card and a crisp 3200x1800 screen. Meanwhile the 17-inch Blade Pro stuck to the lower 860M-tier card and a 1080p screen—and at a higher price. Suffice it to say, it’s been awhile since the Blade Pro felt like it deserved its lofty moniker. For a time I thought Razer had decided to abandon the Pro model entirely and stick to the 14-inch Blade, but instead Razer was apparently scheming a way to put the Blade Pro back on top. Successfully, I might add. The latest Blade Pro is one hell of a machine, and an incredible return to form. Provided you can afford it. 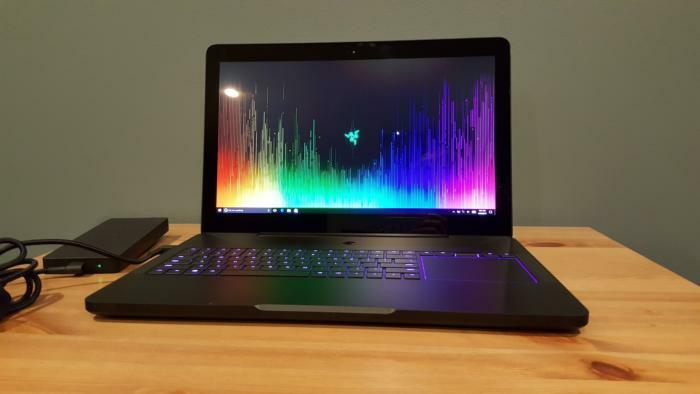 The Blade line continues to be one of the most recognizable gaming laptop lines, in part because Razer’s design barely changes year-to-year. 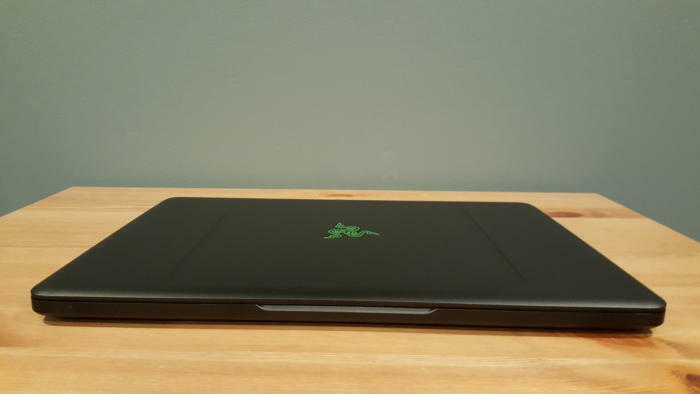 That’s certainly true here, with the Blade Pro looking much the same as it always has—a slim, black, and vaguely MacBook-esque aluminum chassis, emblazoned with Razer’s illuminated green snake design on the cover. Open the lid though and you’ll immediately notice changes, both big and small. First up: the typeface. 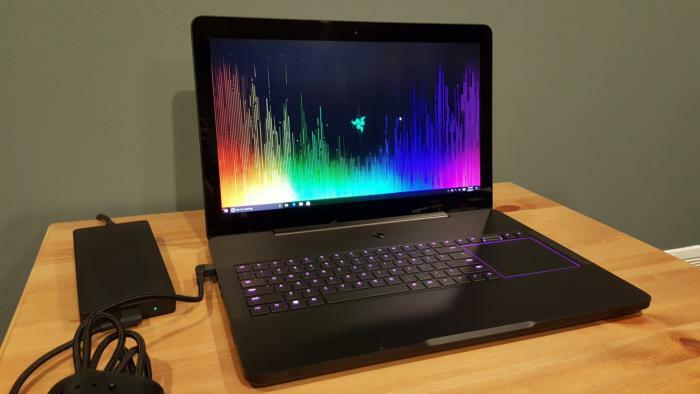 Razer has been gradually transitioning from the orginal blocky typeface on its laptops’ keyboards, and that process is completed in the modern-looking, readable, and ultrathin sans-serif typeface found on the new Blade Pro. It’s a small change, but one that gives Razer’s laptops a more universal appeal—particularly the Blade Pro, which Razer has typically aimed at artists, video editors, and musicians in addition to gamers. Razer’s also changed the feel of its keys, a change I’m more torn about. Described by Razer as “The World’s First Ultra-Low Profile Mechanical Keyboard,” the Blade Pro aims to emulate the tactile feel of a desktop mechanical keyboard, but with the slim Chiclet-style keycaps you’d typically see on a laptop. It’s certainly clickier than a normal laptop keyboard, but I can’t say I love it. Requiring 65 grams of force for each keystroke, that makes it both heavier than Cherry MX Blues and Blacks—typically the heaviest mainstream switches. I found myself typing slower and making more errors on the Blade Pro than most laptops, even after adjusting to it for a few days. And it doesn’t really address what I want from a mechanical keyboard—wrist relief. Chiclet-style keys still have a very small travel distance, which means more finger and wrist strain than a normal desktop keyboard. Combine that with the heavy actuation force and you’re looking at double the strain of most laptops. I like the tactile feedback, but it’s useless to me if my wrists get tired typing lengthy articles. Gaming is the one exception. There, the clicky feedback of the Blade Pro is both satisfying (fewer keystrokes needed per minute) and reassuring, as you know the key depressed properly. But I expect most people will want to type on their laptop too, and in that regard I think the mechanical keys will be divisive. In any case, the keyboard is also equipped with Razer’s now-expected Chroma RGB lighting, same as the Blade and Blade Stealth last year. The lighting also extends to the new dedicated media keys and trackpad. Yes, the biggest change in the Blade Pro is that it abandons Razer’s trademark Switchblade UI. In previous Blade Pros, the trackpad essentially doubled as a second screen. I mean, it was a second screen—albeit one that measured a mere 3.5x2.5 inches. You could use the Switchblade UI for all sorts of secondary functions though, be it browsing Twitter or embedding a Twitch stream into your trackpad while you watched something else on the main display. Cool as it seemed in demos, the Switchblade never really made sense in daily use. I should know—I’ve been using a 2014 Blade Pro off-and-on for a few years now. Not only was it buggy and prone to fits where it decided to no longer work properly, but it rarely made sense to use it at all. After all, it’s still your trackpad. Unless you had a mouse attached, you’d rarely find cause to have it function as a screen, and even if you did it was small, blurry, and likely coated in fingerprints. Oh, and on top of all that, it made the Blade Pro expensive even with subpar hardware inside. So the new Blade Pro ditches it, and rightly so. Now there’s a row of media keys and a volume roller sitting above a 3.5x4-inch trackpad, highlighted by a ring of RGB light around its edges. It may not feel as futuristic, but it works a hell of a lot better. 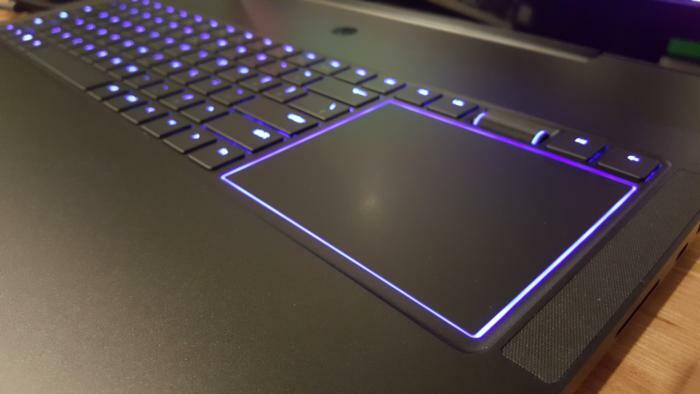 The only downside is that Razer moved to the trackpad-as-button model instead of using discrete buttons like the old Blade Pro. Personally I find a dedicated left-and-right mouse better for laptop gaming, though that’s a matter of personal preference. Then you’ve got power, a pair of USB slots, ethernet, and a combination headphone/microphone jack on the left side; with a lock, HDMI-out, another USB port, a USB-C slot, and an SD card reader on the right. The Blade Pro’s real redemption, however, lies inside. Finally breaking from its past, the new Blade Pro ditches budget hardware for a Core i7-6700HQ processor clocked at 2.6GHz, 32GB of DDR4 RAM, and—best of all—an Nvidia GTX 1080. No 1060-tier card for this Blade Pro. It’s jumped the line straight to the top. 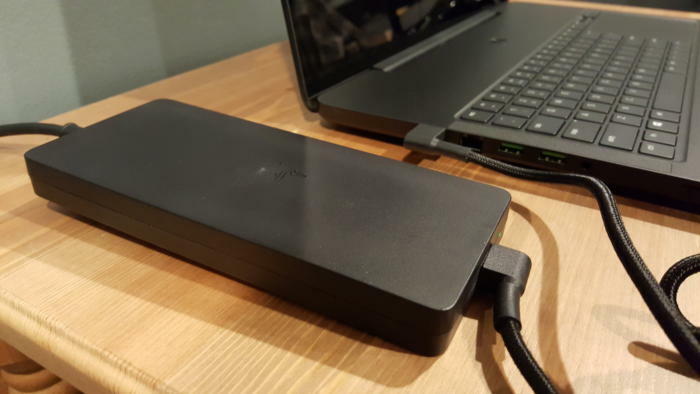 Topping it off are a pair of PCIe SSDs configured in RAID 0 with up to 2 terabytes of storage, and it’s all in service of the Blade Pro’s first-ever 4K IGZO screen. It’s the same bright and vibrant panel we’ve seen on the standard Blade for years now, except in a 17-inch model. This is how you do a flagship laptop. The Blade Pro’s not the most powerful laptop we’ve tested, but it’s certainly a top contender in this form factor. 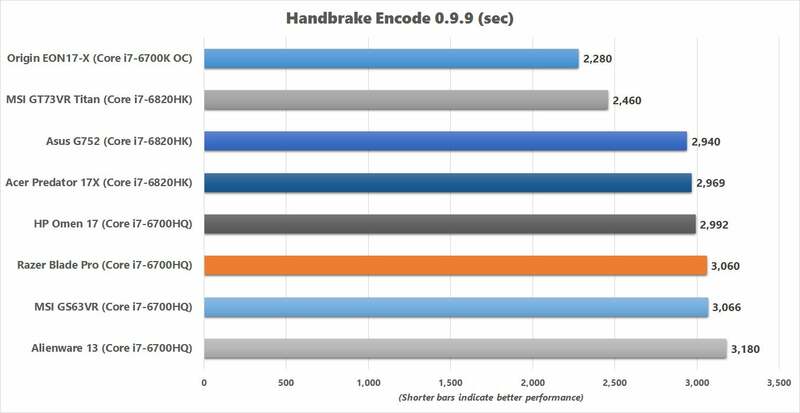 Even given its slim MacBook-style chassis it managed to score a 7,909 on 3DMark’s FireStrike Extreme benchmark, handily beating every 1060- and 1070-class laptop. Not every 1080-equipped laptop though, and therein lies the rub. Throughout our time with the Blade Pro, we noticed that although it beats out the 1070, we’re not quite seeing full 1080 performance. 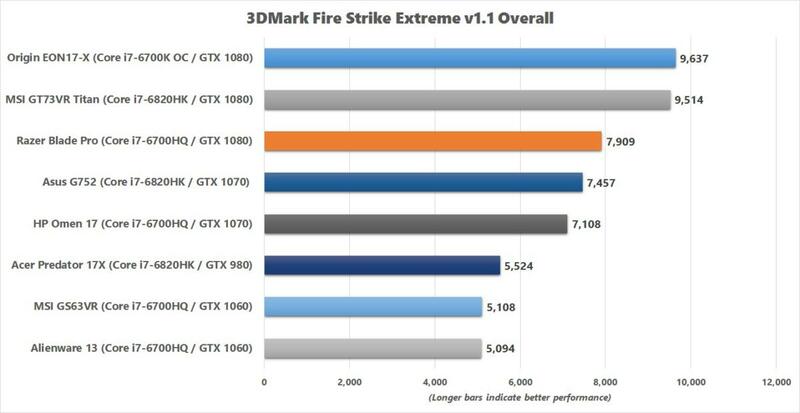 For comparison, the 1080-equipped MSI GT73VR Titan scored a 9,514 on the same test, and the Origin EON17-X a 9,637. Those laptops have better processors, but that can’t quite explain the discrepancy. What can explain the discrepancy, then? Thermals. Like other slim laptops, the Blade Pro has a heat problem. Sure, there are enough fans packed into this thing to make it sound like a jet engine while gaming, but you’ll still notice the aluminum frame getting hotter and hotter as you put it under load. All that heat and nowhere to go? The laptop’s going to throttle down to try and keep its parts from overheating. That’s the likeliest explanation for why we see good performance but not necessarily full-1080 performance in all applications. 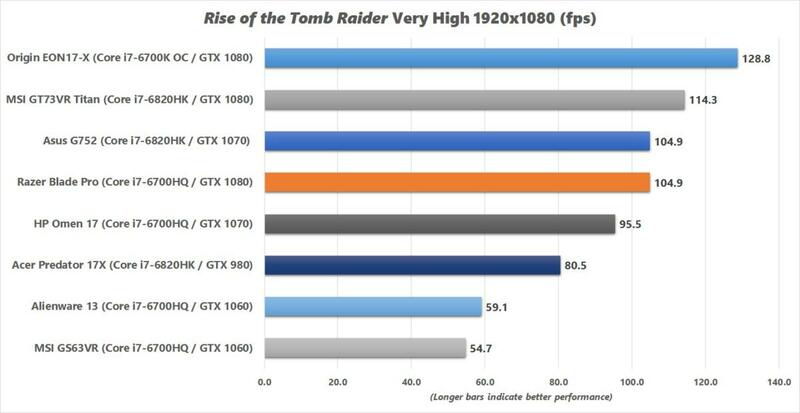 Moving to Rise of the Tomb Raider, for instance, the Blade Pro managed 104.9 frames per second in the benchmark, running at 1080p, Very High settings with FXAA. The aforementioned MSI machine managed 114.3. 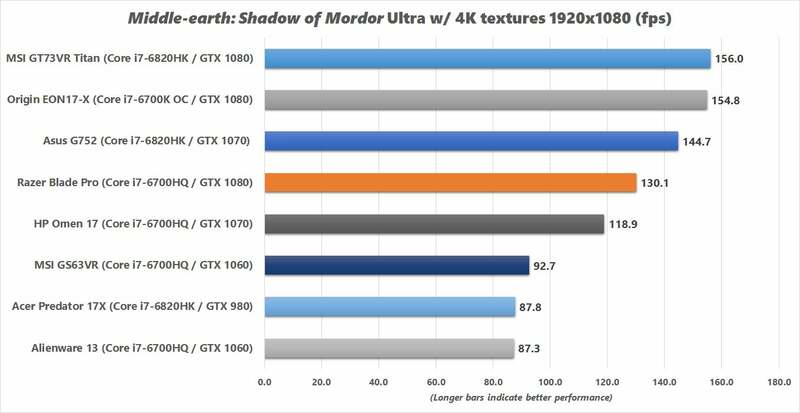 And in Middle Earth: Shadow of Mordor at 1080p, but on Ultra with the 4K texture pack, the Blade Pro did 130.1 frames per second to MSI’s 156.0 and the EON17-X’s 154.8. On the other hand, the Blade Pro weighs a little over seven pounds. The Origin EON17-X weighs almost 10. Yes, three pounds is a huge difference, as anyone who’s carried a 10 pound laptop all day can attest. And as I said, you’re still getting more performance than any 1070-equipped laptop. The HP Omen 17, for instance, which features the same i7-6700HQ and a GTX 1070, managed 95.5 frames per second in Rise of the Tomb Raider and 118.9 in Shadow of Mordor. That’s shy of the Blade Pro on both counts. Think of it as a tradeoff, then. Yeah, you’re paying for the more expensive video card and not getting its full performance. On the other hand, you saved three pounds of weight on your back, and are still getting more power than if you’d taken the step down to the 1070. A bittersweet compromise, maybe, but I can’t fault Razer’s logic. As for its processor? It’s the same i7-6700HQ part we’ve seen in many laptops at this level. It’s not a bad bit of hardware, but hardly as impressive as fitting a 1080 inside the Blade Pro. Our most strenuous test involves re-encoding a 30GB MKV file down to a smaller MP4 using Handbrake, a process which took the Blade Pro 51 minutes. That’s right in line with the 6700HQ-equipped Alienware 13 (53 minutes) and MSI GS63VR (also 51 minutes). It also falls predictably short of MSI’s GT73VR and its 6820HK, which did the job in 41 minutes, and well short of the EON17-X’s overclocked i7-6700K part at a stunning 38 minutes. But again: That power in this size laptop? Impressive. The last change of note in this year’s Blade Pro: a larger power supply. Not much larger, but definitely bigger than the sleek oval used before. This one’s a standard rectangle shape, 7.5x3.5 and about an inch tall. It’s still smaller than most 1080-class power bricks, by about half, but it’s unwieldy. Worse is that Razer changed the power connector. It used to be a circle that swiveled in any direction, but now it’s a rectangular slot with a cable that’s locked facing either forward or backwards. Many times over the last few weeks I’ve gone to set the Blade Pro on a desk only to realize the cable would be crimped unless I unplugged, reversed it, and plugged it back in. A small complaint, but one that’s been frustrating me day-to-day. And the battery itself is nothing special. Though it’s as large as Razer could use and still be plane-safe, expect your Blade to last around four hours for low-intensity tasks and closer to two when gaming. Oh, and price. If you’re reading this thinking, “Well this all sounds too good to be true,” get thee ready for the sticker shock. The Blade Pro’s huge leap in performance is matched by a similarly stunning leap in price, with the baseline 512GB model retailing for $3,699. The 2TB model is a jaw-dropping $4,499. 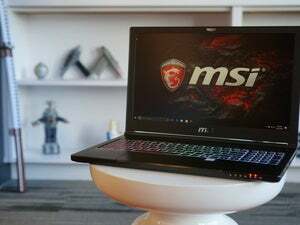 Now there are certainly reasons for it to cost that much: a 4K screen with built-in touch capabilities and G-Sync, 512GB of PCIe SSD storage, a GTX 1080, its aluminum chassis, its size and portability. I’d certainly have an easier time explaining the Blade Pro’s cost than, say, a 2016 MacBook Pro. Still, it’s safe to say the Blade Pro is priced outside the range of all but the most dedicated of on-the-road gamers, or perhaps dev studios, whose need for portable demo hardware outweighs the needs of the wallet. You can get more bang for your buck with other laptops, but none are as lightweight as what Razer’s offering. It’s hard to argue with the Blade Pro moniker this year. There’s still room for improvement, sure. The new mechanical switches could use a bit more tinkering, the power cord is a disappointment, and it doesn’t always deliver the full horsepower of a 1080. But it’s close enough. Crammed into such a small package? The Blade Pro is probably the best portability-to-power ratio on the market right now. 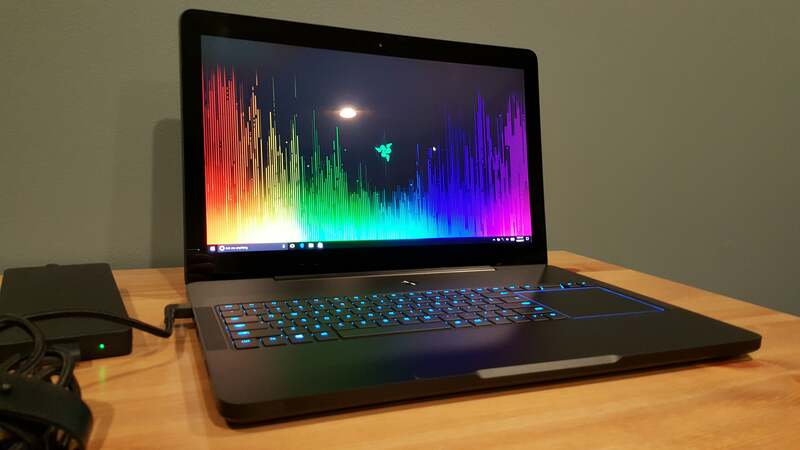 Add in the gorgeous screen, the SSD storage, basically all that stuff I mentioned above to justify why it costs so much, and I’d say Razer’s put together one hell of a laptop. Congratulations, Blade Pro—you finally lived up to your name again. For the first time in years, the Razer Blade Pro feels like it deserves the name. Packed with an i7-6700HQ and a GTX 1080, there's a lot of power in this slim laptop.